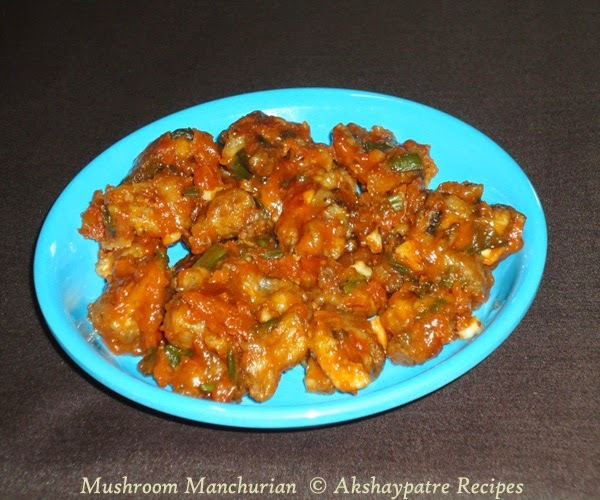 Mushroom manchurian recipe - After having a hearty Chinese meal at Mainland China, along with family friends from Delhi, we returned home with a sweet memory of the Chinese dishes. Among them one unforgettable dish was mushroom manchurian. I have prepared mushroom manchurian several times on the demand of my kids. I must admit here that I too started loving this addictive dish. As this is a familiar dish, I did not find it difficult to prepare. Using mushrooms and ching's manchurian sauce mix, I made this manchurian quickly. It turned out delicious as usual. So, I thought to share the recipe with you all. Note that you can also replace mushrooms by paneer. You can also make mixed vegetable manchurian by using vegetables like cabbage, cauliflower and carrot. Wash the mushrooms thoroughly and cut them into 2-3 pieces. Mix the maida, corn flour, garlic paste and salt together. Add little water to make a thick batter. Then mix the mushrooms and the batter together. Deep fry them till crisp. Heat a tbsp of oil in a pan. Keep it on low flame. Add Ching's Manchurian sauce and stir. Add 3/4 cup of water to it. Mix well. Bring it to boil stirring constantly. Simmer for 2-3 minutess to get a thick sauce. Add fried mushrooms and mix well. Simmer to get the thick consistency. Once it is done, add the chopped spring onions and remove from the flame. 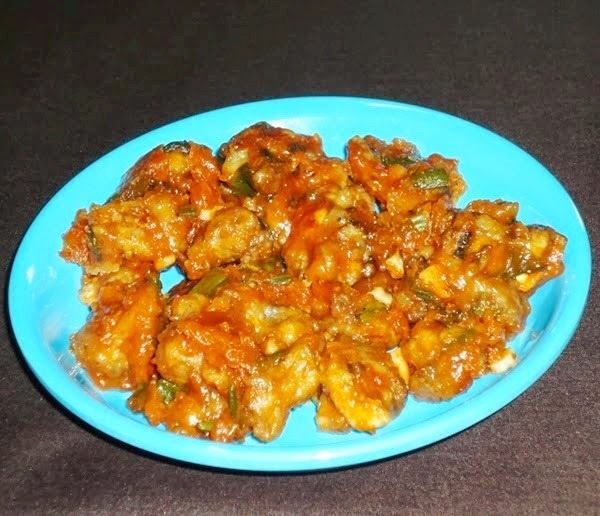 Serve the mushroom manchurian hot with choice of your main course dish. Mushroom manchurian looks delicious. I have some mushroom in my hand. Wow. Delicious. Thanks for sharing. wow.. wish i could grab that plate..